A thing that I’ve been working on during any free time (and then increasingly during not-free time) since October has finally come to fruition and I hope to be able to share details as soon as paperwork is signed. This is not exactly quilting-related, but more life-related, but I am super excited about it! 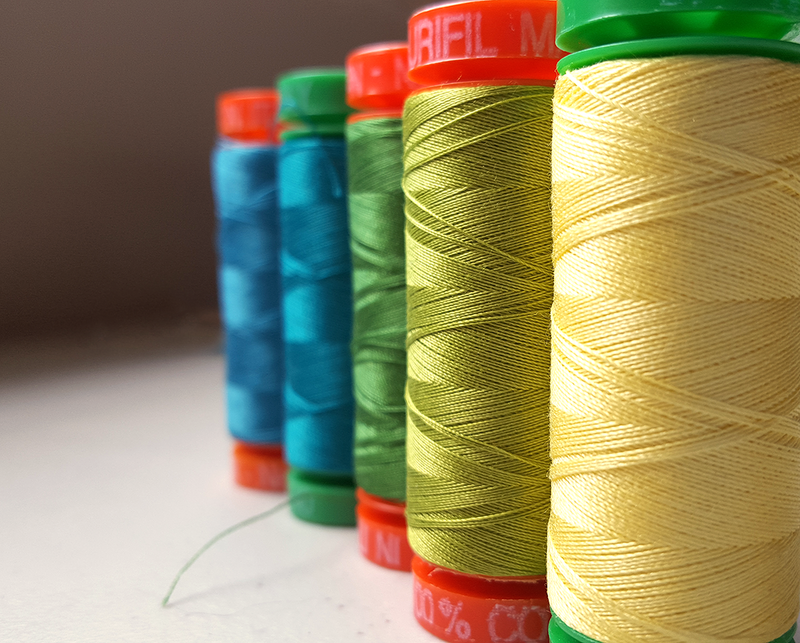 It also means that a whole bunch of free time has opened up which (fingers crossed) means more quilting and blogging! With that said, there’s still a few things to finish up but I have plans to sleep the entirety of the first week of May and it will be glorious. In the meantime, I’ve been sneaking in sewing time while I can and I managed to finish this mini-quilt a while back but am finally getting a chance to share it on the blog. 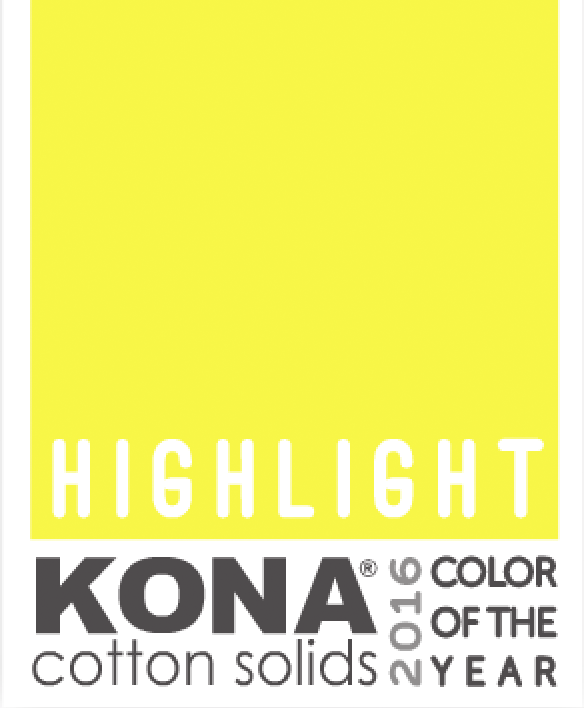 This year, Robert Kaufman announced their own Kona Color of the Year, and this year the color was Highlight. I got a fat quarter of it while I was at QuiltCon and spent the plane ride home brainstorming what I wanted to do with it. The color is quite bright, and it also veers just a bit into green. So putting it with warmer colors makes the green really show up which can come across as a little sickly. 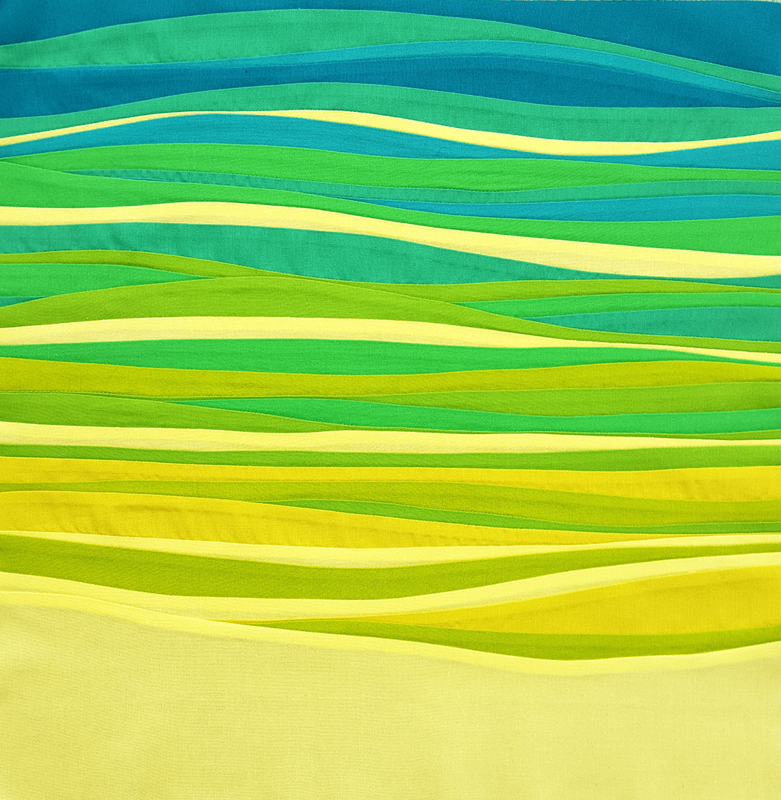 I wanted it to look more yellow, so I put it next to some greens which pushes it more into the yellow territory. (I talk about this quite a bit in my Color in Context post). I’ve done a few projects with improv curves in the past, but I’ve been inspired by some of the beautiful work of Jayne @ Twiggy and Opal, so I decided to give it another go. I went with an analogous color scheme, sweeping from yellow to yellow-green to green and then a bit further into blue-green. The original plan had the block with the yellow at the bottom, but I switched it at some point during the creation of the quilt. In the past, I’ve always felt like I’ve under-quilted my improv curve pieces, so this time I went all out. 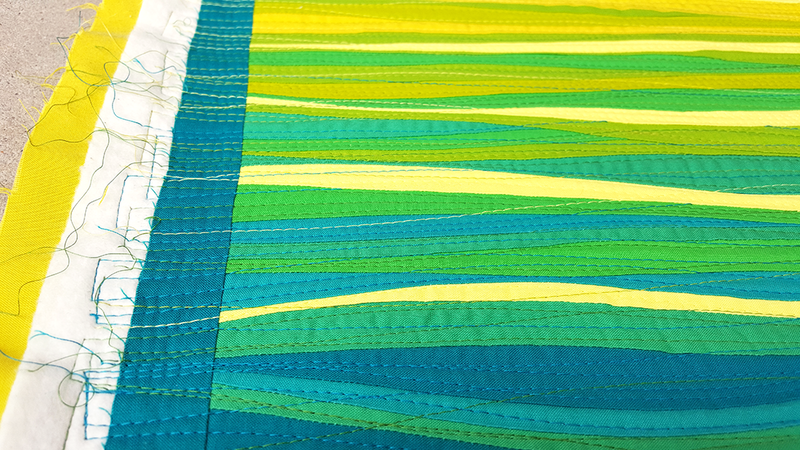 I used 5 different colors of Aurifil, keeping the yellows more towards the top and the teals more towards the bottom. I’m pretty happy with how it came out! For the binding, I did a facing because I wanted the quilting to go right to the edge. I followed a different facing tutorial this time, and I like the way the corners came out with this method quite a bit. The tutorial is by Terry Aske Art Quilt Studio and can be found here. One of the things I did differently design wise is I made a rule to follow with the way the colors progress. It made the whole thing a LOT less anxiety-ridden (improv is hard for me. I’m still learning!) Bonus: when people look at it they don’t immediately see the pattern I followed, so I’m calling that an overall win! And because I am never completely happy with any project I do, my note for self for future design decisions: Why did you border the top? whyyyy? The continuation at the bottom is great, and it would have been even better had you continued that out the top as well. Threads: Yes. All of them. Final thoughts on Highlight: I found this an enjoyable challenge, although I don’t see myself using a lot of this color in the future. The hint of green makes it hard to pair with warmer tones which limits its usefulness for me. 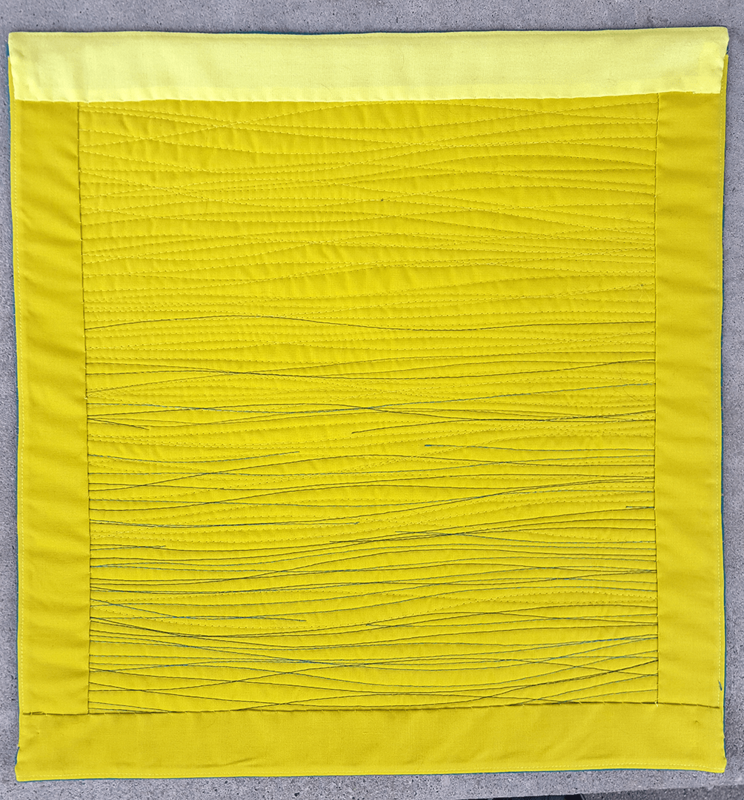 On the other hand, I do appreciate yellow getting some love, and I like the way it pairs with Wasabi and Pickle which show up in a lot of my quilts these days. My thoughts exactly. Anne, your lessons on color in context are invaluable to me. You could take the blue off the top quite easily since you face bound it. I love, love, love this quilt.love the colours, the facing and the quilting. Not that I’d want to remove that blue off the top like Wanda suggested, too much work for me, but I can see the yellow at the top like the blue on the bottom. When I get a minute, I’m going to check out some of those links. Btw, what ever happened with the interviews? Guess who will be visiting California again this year? Thank you so much! I figure if the blue drives me crazy enough, I’ll consider removing it. 🙂 For some reason, removing hand stitching is a lot harder for me to face than removing machine stitching. I love this, this kind of striated work has been the n my mind a lot lately. Your quilt is very inspiring. This style (but more curved) is what I am thinking of doing for the beesewcial swap. Which I should probably get started on! Thank you so much, Ruthann! It was fun to just play for once instead of having a strong plan in mind. Not a fan of yellow but this looks really good to me 🙂 Well done! Anne, I love how detailed your blogs are with both the thought and design processes! This piece is beautiful and my first thought is ocean….. Improv is my very favorite although I end up not giving myself the amount of time it takes?!?!! I hope whatever big event you’ve been planning comes to fruition!! I love this to bits! 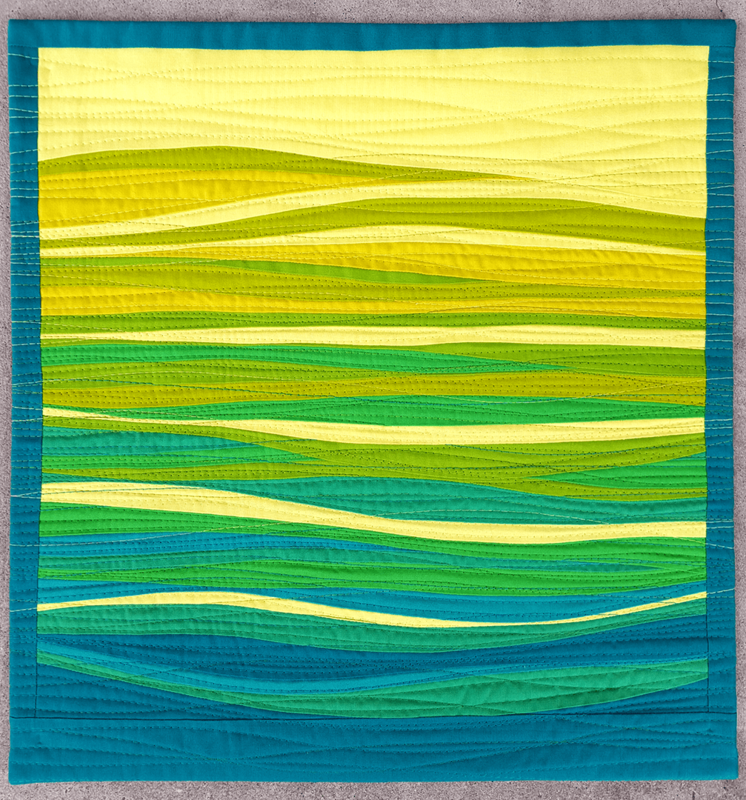 A beautiful use of highlight and your quilting is pretty darn cool! Leave the blue alone. It needs the frame. Unless you are going to take it off the sides too? No. Either way, I love it. I reminds me of the Palouse hills where I live, either fading into the foothills of the Rockies to the east, or the mid-day sun on the hills. Does it need a home???? I’ve been wanting to get my paws on some of this color. 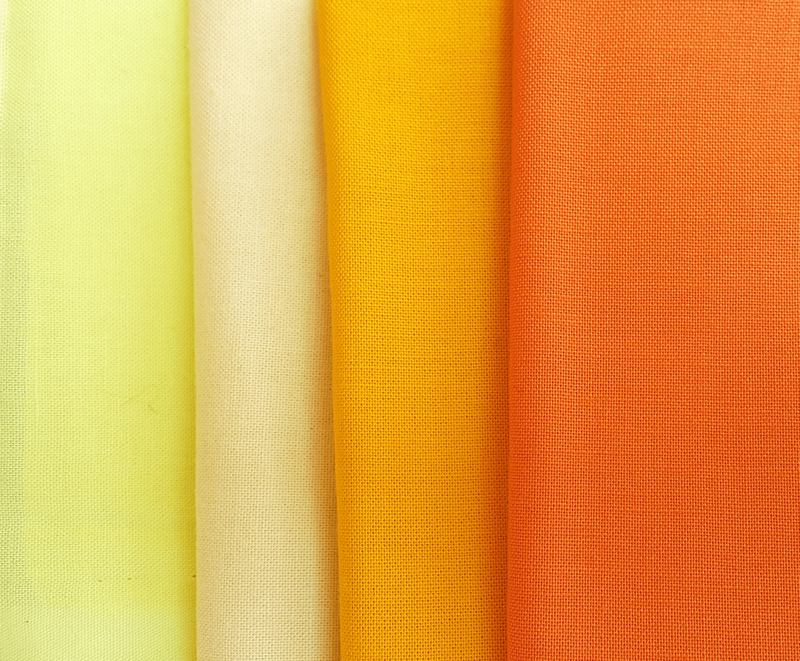 And, yes, yellow is a hard color to use in a quilt, and in most other things really. A little goes a long way because it is clear and bright. I have some leftovers of the color, about a F8 worth. Would you like me to send it along? You really know how colors read, and how they work with one another. Impressive. By contrast, My use of color is simply by reaction… which explains why I have failures. I sure love what you did with highlight. Your piece is gorgeous! I hope you enjoy your week long sleep … that sounds like bliss. Hopefully you will dream up more fantastic minis like this one! So, thank you for the plug! You inspire me so were even!! I love this piece! The curves, colors and quilting are perfect. Every time I look at it, it makes me want to drop everything and do some curves! The colors are so unexpected! You could change the top, but I actually like it just the way it is. As for highlight, it’s a fun color to play with. 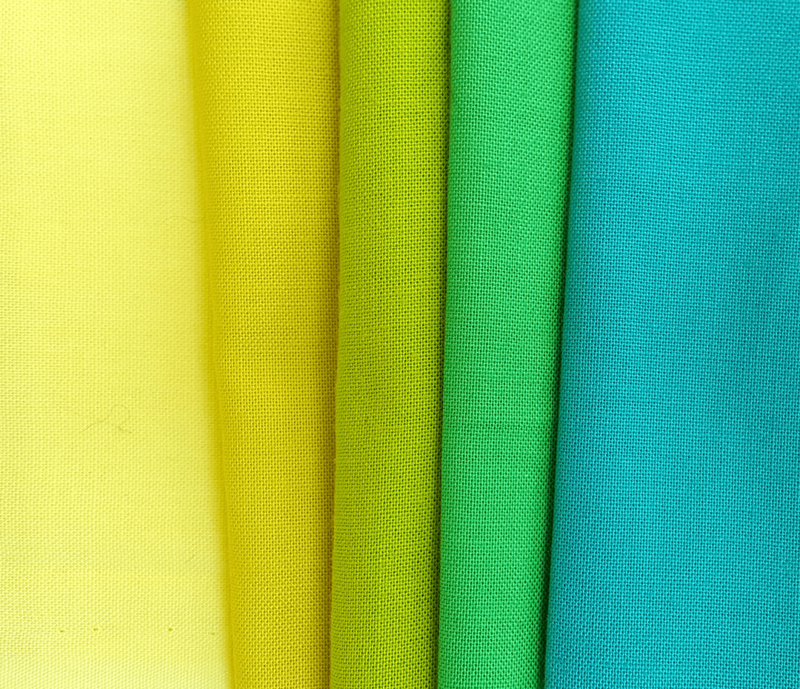 How could you not grab a piece of Kona’s color of the year?! I was just looking at the tutorial for the faced binding this morning! Can’t wait to hear your big news! Let us know as soon as the ink dries! I’d love to see you do more work with curves!! Your improv curve work is some of my favorite stuff ever. 🙂 It was definitely fun to play with the Color of the Year! I sure hope they continue doing it. 🙂 Although by next year I will probably have forgiven Pantone. We’ll see. Anne, while I understand your point about bordering the top (and think that yours is the most valid opinion, as the artist), I just wanted to share my impression–when I saw it, I thought about looking through a window, seeing an ocean sunset, and then, as my gaze went down to the horizon, the window frame became part of the scene, changing my perspective. So, while you might wish you’d done it differently, your original choice was an interesting one to me, surely informed by the years I spent doing dishes at a kitchen window in San Clemente, CA that overlooked the Pacific Ocean. I miss those sunsets. I really miss the west coast. Ohhh – I remember you saying you wanted to do something with Kona Highlight, and this was worth the wait! It puts me in mind of many things, all of them pleasing. 🙂 Would love to know what you did so that you could continue the quilting up the the edges, it’s really effective. Love the blues and greens you put with it. Those are some of my favorite colors – the blues and greens. But then I like a lot of colors. Thank you so much! I’m with you, I have yet to meet a color I don’t like. 😀 But blues and greens do often go so well together! I could not stop gazing at your beautiful quilt. It is a piece of art! You are very talented. It looks far more complex than it is! This is one of the best uses of this yellow I’ve seen. I love it!!! Thank you! I quilted it with my regular foot, I don’t think I bothered with the walking foot. I’d suggest getting your machine or walking foot serviced, it shouldn’t be making the stitches go wonky, if anything I find it makes my stitches a lot more uniform in length! Good luck, having a working walking foot is a game changer!